Hello and happy Thursday! When I saw this gorgeous set from Crafty Secrets Clear Art Stamps~Poppy, at the ABC Toys and Crafts Store, I knew I had to have it! 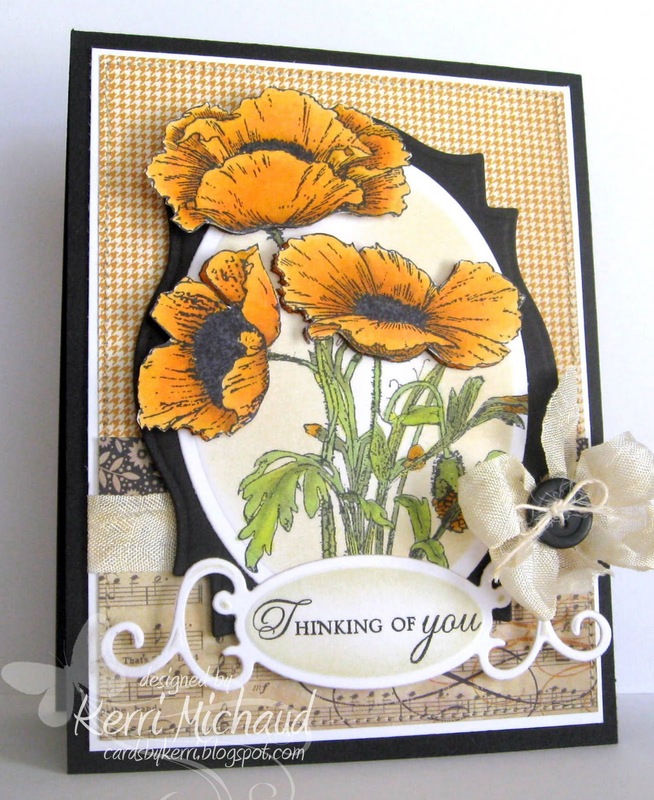 These flowers are stunning and make it so easy to make a beautiful card! I stamped the poppy image twice with Memento Tuxedo Black Ink. I colored one of the images with Copic Markers and cut it out with Oval Nestabilities. I then layered the oval on a Labels 18 Nestability. I colored the remaining flowers heads that I stamped and cut them out so I could pop them up on foam squares. I just love the dimension this adds! After I chose my sentiment, I cut it out with a Spellbinders Fancy Tags Die, and sponged around it with some Ranger Antique Linen Distress Ink. The dp I used is My Mind's Eye Lost & Found Two~Sunshine, and I added some seam binding, a button, twine, and some stitching to finish it off. All Spellbinders Dies are currently 20% OFF until September 30th!!! Everything is 10% OFF suggested retail everyday!!! Clear Stamps $12.00 or more ship FREE in the US!!! Definitely sounds like it's time to go shopping right? Also, make sure you check out our current ABC DT Challenge~Back To School~ HERE! Well, for those of you wondering how my daughter did on Sunday at her gymnastics meet, she WON! First place all around out of 59 girls!!! We were so proud of her:) She has another meet this Sunday in Daytona against some much better gyms, so we'll see how she does. I'll be back later with a very special surprise and announcement from Your Next Stamp~Sooooo EXCITING!!! You are going to LOVE IT!!! WOW, what a proud moment to have your DD get 1st place...CONGRATULATIONS!! Now you've enabled me to check out the sale! 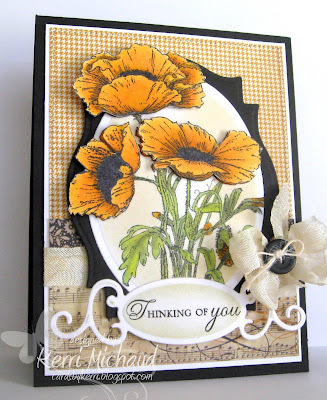 :-) Oops...almost forgot to say how much I LOVE that poppy card! I love those flowers! WOWZER!! Kerri, this is so stunning girl!! LOVE your design and colors!! Grogeous - what a great mat shape!!! This is beautiful...I might have to get that stamp. I've just colored my first flower image and now I'm hooked!! Dear Kerri , You make so wonderful and lovely works! I enjoyed the visit on your site. Many thanks for your beautiful inspirations!! Please take a look on my Blogspot.